ULTIMATE DESIGNER VS DUPE LIST!! 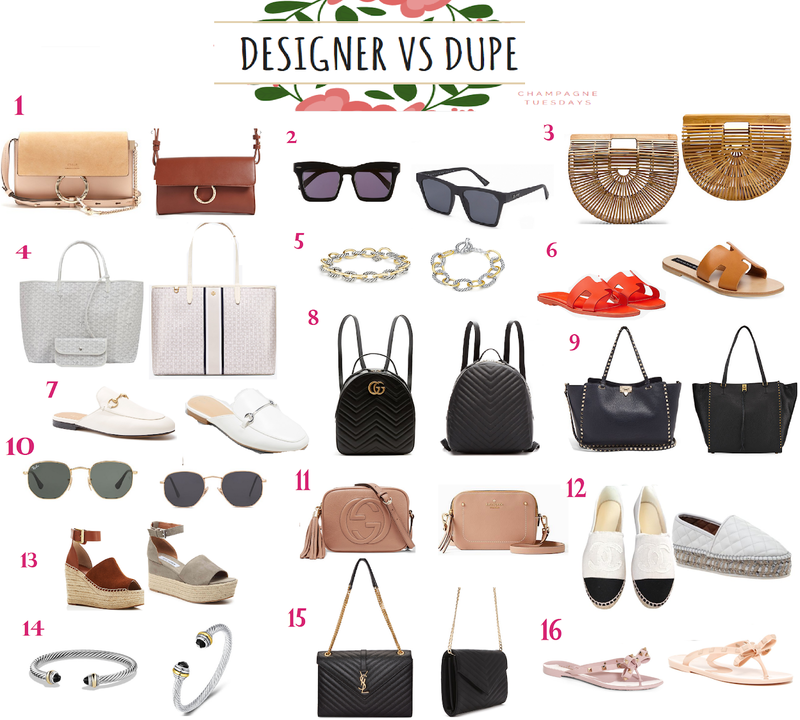 Here it is people, the ULTIMATE round up of some of my favorite designer items and their dupe look-alikes! I love to treat myself every now and again (far too often, actually), but I do pride myself on being a bargain shopper/sale hunter. I firmly believe looking good and keeping up with today's trends don't need to break the bank. Sorry in advance if you end up spending more money than you should!!! Chloe bags are just so beautifully made that I don't think there will ever be a real fair comparison BUT... ok Forever 21, I see you on that dupe. I think Karen Walker has to be one of my favorite sunglasses designers, but I don't really trust myself to not lose/break nice pairs of sunglasses so I'm always getting cheap pairs over nice, expensive ones. I have the Quay ones and I am OBSESSED with them! ...already kinda broke them too, because I am the worst. This is my favorite summer clutch right now! I never like to pay such a steep price for something that I know is a trend and will go out of style so I was excited when I found this dupe that is IDENTICAL to the real thing. I think this is the perfect work tote so I would say it's worth the splurge if you're treating yourself for graduation, or a new job, etc. but after I saw this similar looking Tory Burch tote, I'm not even sure which one I like better! Although I love David Yurman jewelry, it's not something I'd ever buy for myself. It's definitely more of a gift for a special occasion so I'd purchase a dupe for sure. These dupes are so SPOT ON I would never splurge on the designer pair. It truly pains me that anyone would ever pay for real Gucci loafers when there are SO SO many great dupes! I have these white ones from Target that I've been wearing to work all the time lately - so perfect for summer. Although I'm not sure I could ever get in on the trend, there's no denying that backpacks are in right now. Again, not a trend that is *hopefully* going to last forever so if I did ever want one I would opt for a very inexpensive one. This dupe is still a bit of a splurge for sure, but I was amazed at how much it looks like the real thing! Again, I don't feel that this hexagonal sunglasses trend will stay in style for years to come but I absolutely love trying funky and fun new sunglasses so I'd definitely purchase the dupe. This bag is one of my most recent purchases and I absolutely LOVE it! I can't say enough good things - definitely worth the splurge. That being said, I was so impressed when I saw this similar Kate Spade bag. I'm not normally a huge fan of Kate Spade bags but this one I'd definitely purchase if I didn't have the Soho Disco. I'm not comfortable splurging so much on a pair of shoes just because if I did, I know I wouldn't get a lot of wear out of them so what's the point? If I ever did though, these would be the shoes. OBSESSED! Again, I've seen tons of great dupes though! Tory Burch also has some cauuuuute espadrilles as well. I have both versions and I have to say the price point for the Marc Fisher's are well worth it because they are so much comfier and overall better quality than the Steve Maddens. I own a couple of these and I loveeee them. But again, I got them as a gift. If I wanted to purchase a bracelet like this for myself I'd probably get the dupe. This is the bag I'm currently obsessing over and would probably be my next splurge if I was in a position to buy a new bag (which I am most definitely not, lolz). Again, these are SPOT ON so I would go with the dupes all damn day. What's one item you'd have no problem splurging on? Yes exactly! You don't have to pay for the designer price to look good! This was pretty cool. Somethings look so similar, almost identical. This is such a lovely guide dear! Indeed, you don't have to break the bank to look fashionable. Oh my goodness! Yes please! This post is EVERYTHING. Thank you so much for sharing this! I love them too! Thank you for reading! Oh very good choices, and I agree the savings are incredible. Sometimes it is so hard to comprehend how expensive designer merchandise is. I appreciate that so many of these locks are on the classic side too. Totally agreed! I love to splurge every now and then to treat myself but besides that, i'll take the dupes. Love this post. I used to be so into designer brands but now I'm older there more important things I'd rather spend my money on. Doesn't mean I still don't enjoy good design though, this list is so helpful! Thanks for sharing! Such a great post! Have you tried any of these dupes? Would love to see how they hold up! These are all such great finds! I love the little backpack! Hope you're well and hope you have a lovely weekend! These are such good choices! The purses are so cute!